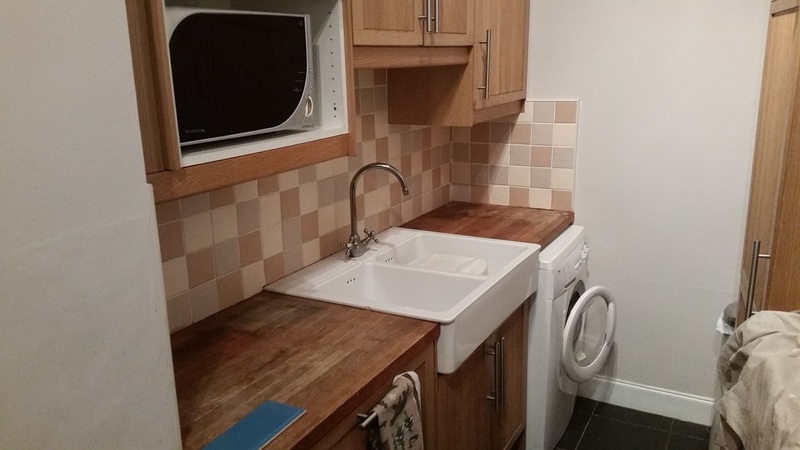 Handy David Edinburgh was Tasked with fitting a galley kitchen. 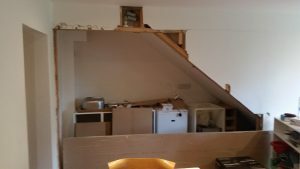 Only trouble was that it was going under a staircase which was currently a cupboard! 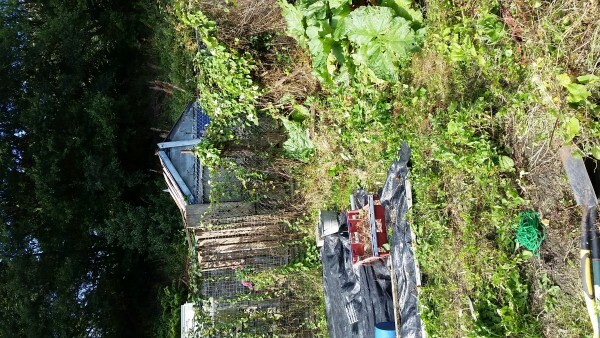 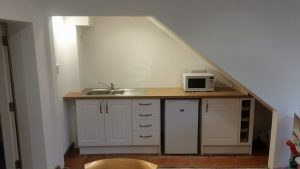 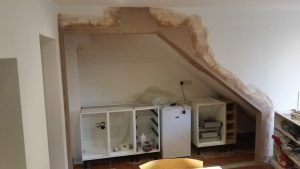 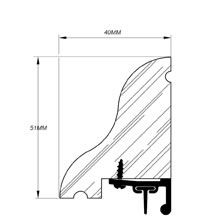 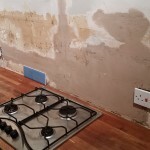 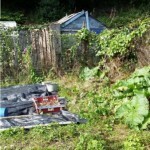 After a meeting with an Architect it was established that the wall to the cupboard was not in any way structural and this could be removed and work could commence. 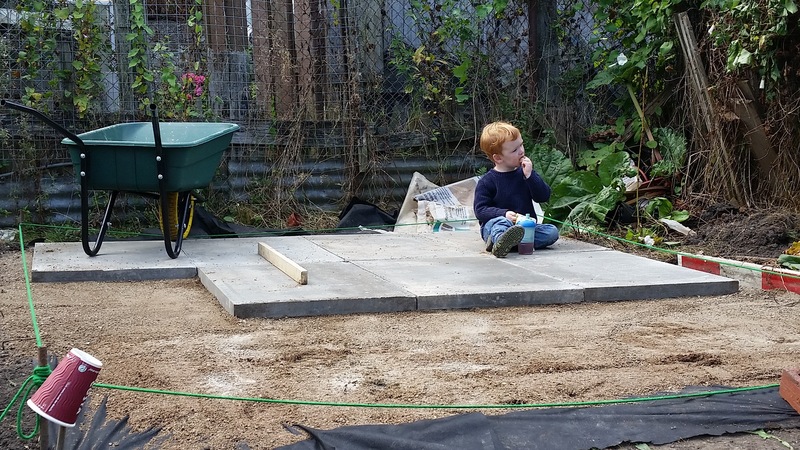 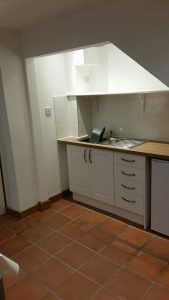 In Conjunction with the Architects plans and a consultation with a Howdens kitchen designer a new kitchen was promptly delivered and ready to be installed. 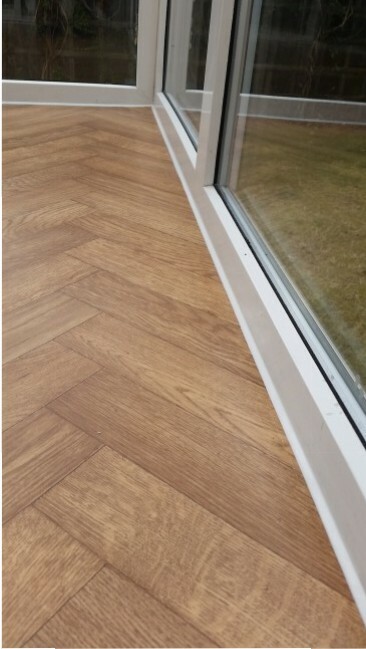 Howdens units are probably more expensive than other competitors but with the units coming pre-assembled this can reduce labour by a considerable margin, especially on a larger scale project. 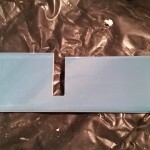 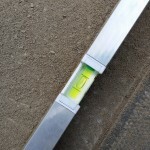 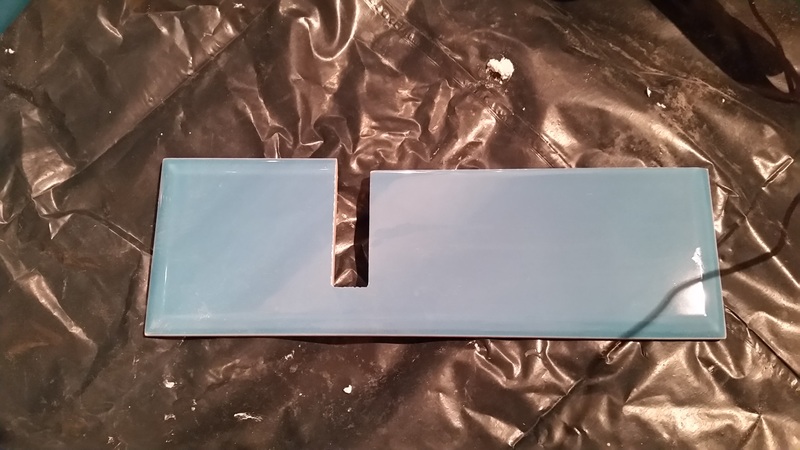 The base units are also thicker base material. 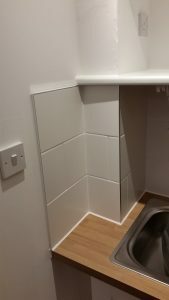 These units Unlike an IKEA unit for example come with a small cavity at the rear of the unit which is useful for the installation of services, such as cables and pipes. 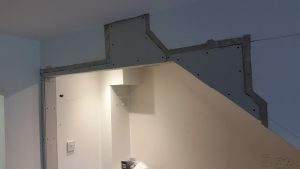 Howdens base units installed and wall patches plastered. 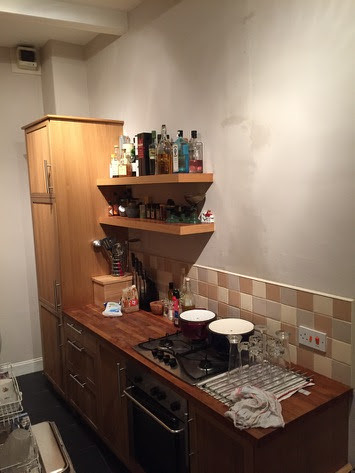 The heart of any home is the kitchen, so it is important to try and get it the way you want it. 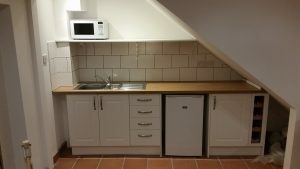 Some people may have a large kitchen with plenty of space and ventilation, but in many cases in the heart of the city it can be a more modest space which needs a little more thought and careful planning to make it work successfully. 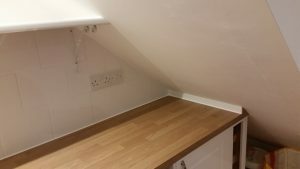 For this job the kitchen was a galley style, with good work surface and storage space but sadly lacking in any real ventilation other than a small extractor fan fitted at high level, almost like an afterthought. 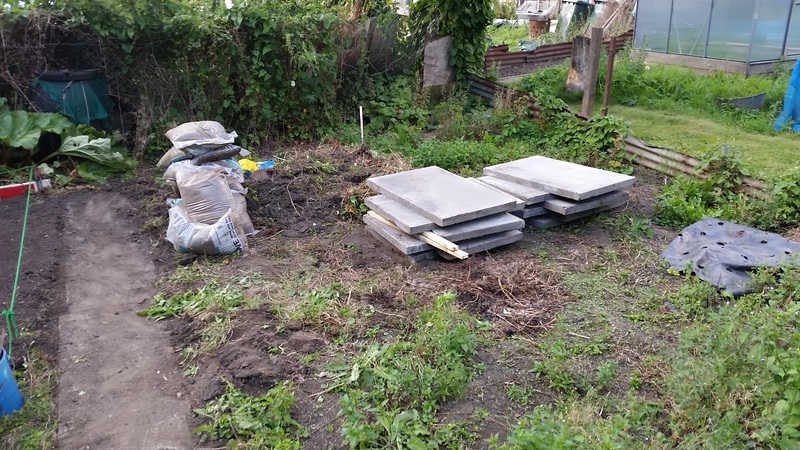 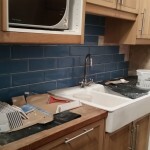 The plan was to remove the old tiles and freshen the area up with a more modern feel. 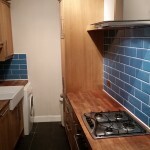 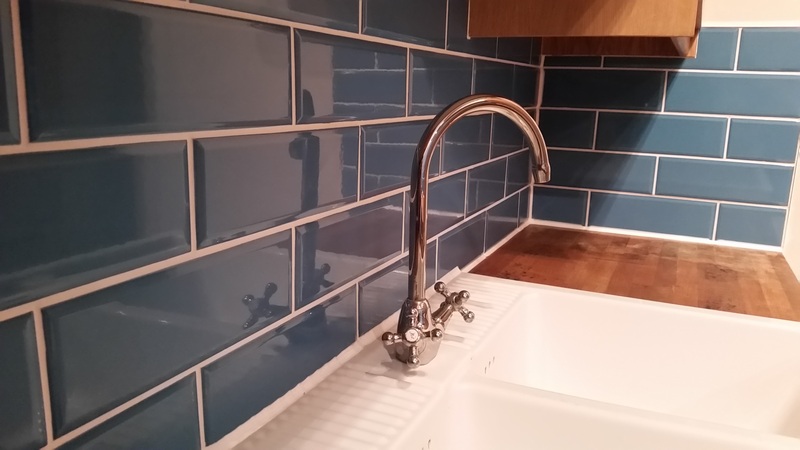 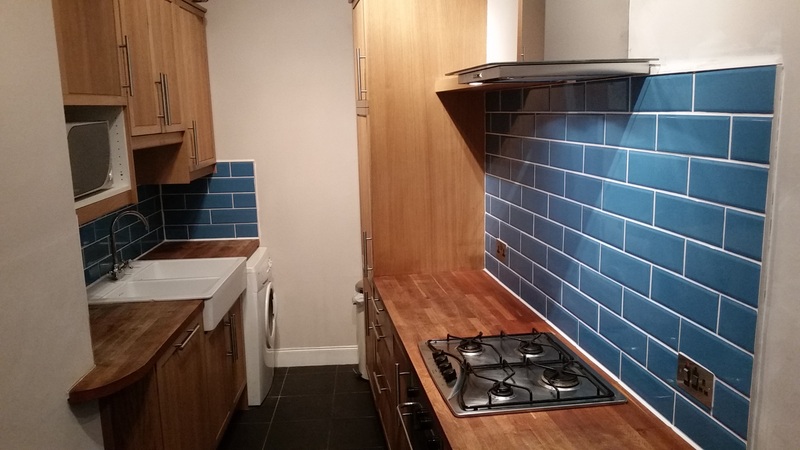 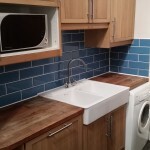 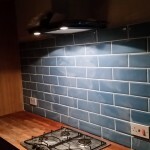 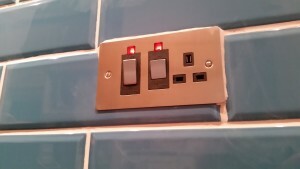 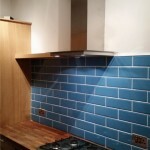 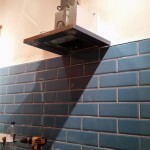 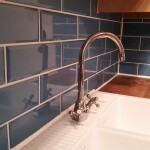 The tiles used were Diamante Teal sourced from Topps Tiles. 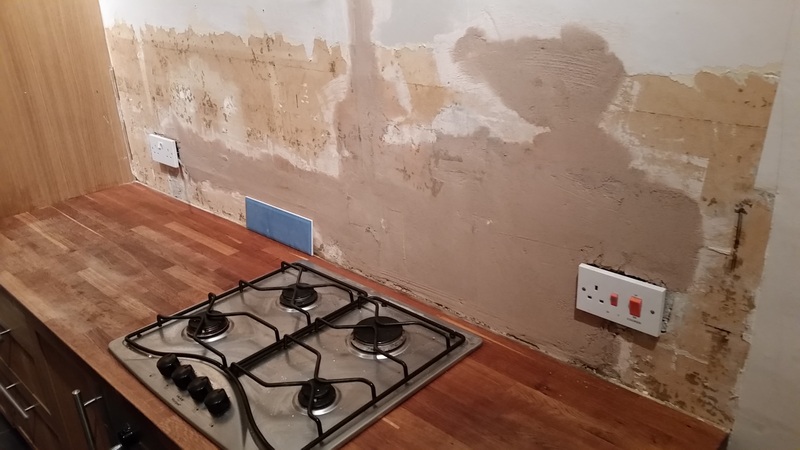 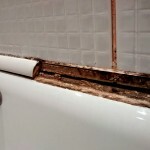 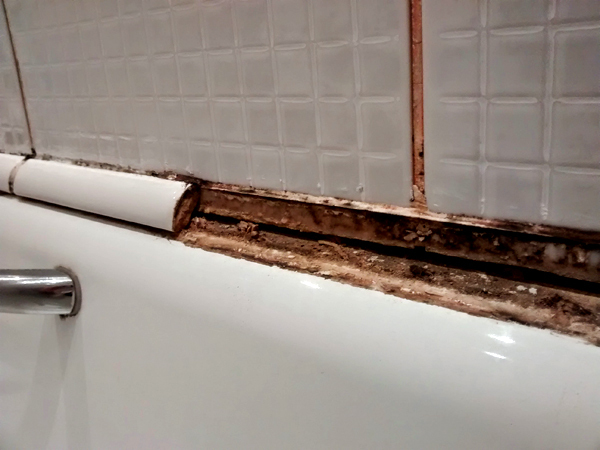 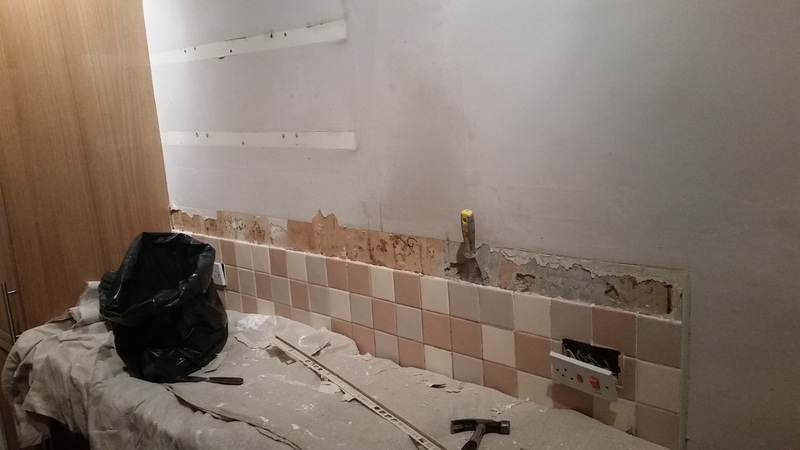 The first task was to remove existing shelves and tiles from the walls. 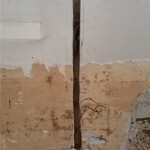 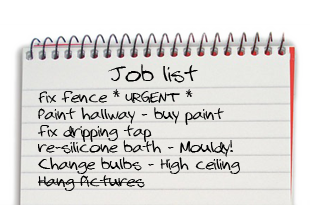 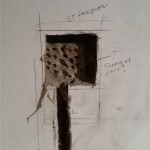 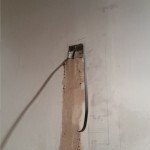 In this case they came away with relatively little damage to the walls. 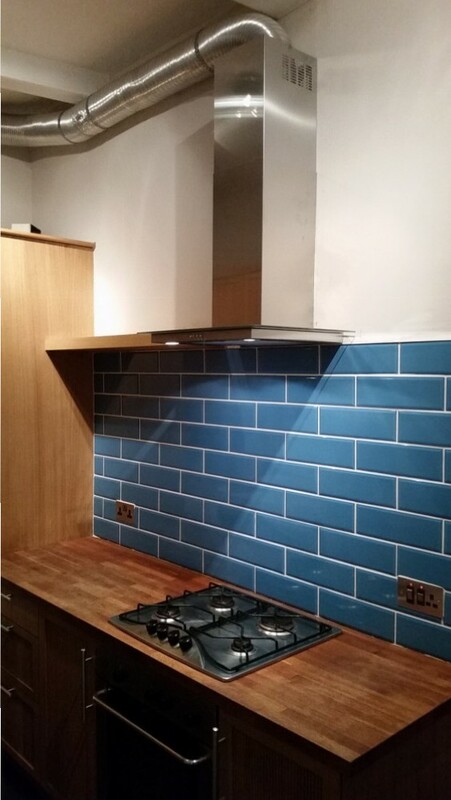 The position of the new extractor hood also needed to be calculated to sit just above the final row of tiles, and centrally over the hob. 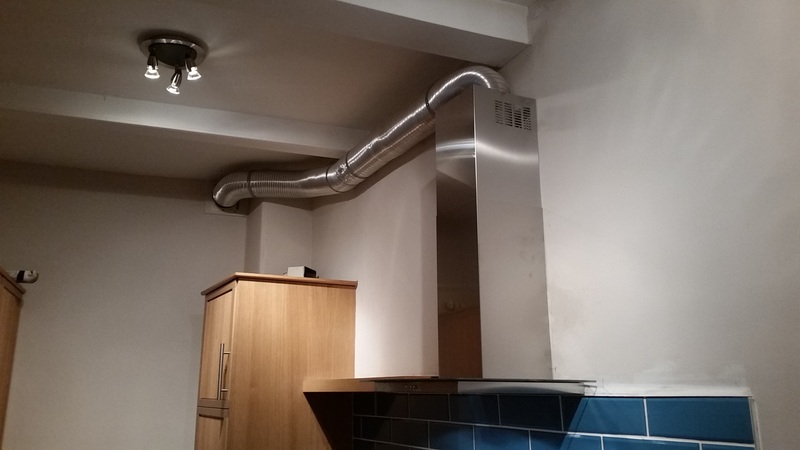 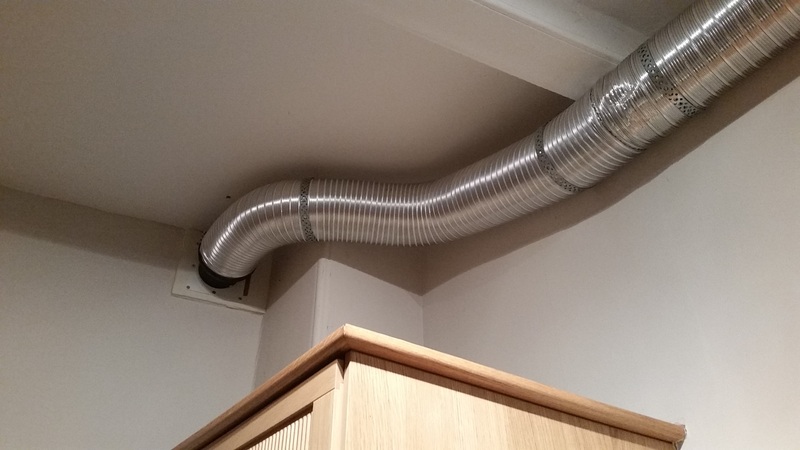 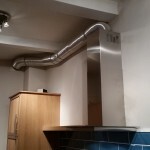 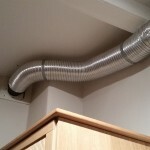 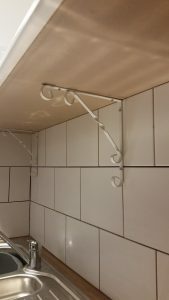 For the cooker hood a channel was required to be chased into the wall for the electrician to run a cable to a switched fused spur which would be located behind the extractor hood ducting. 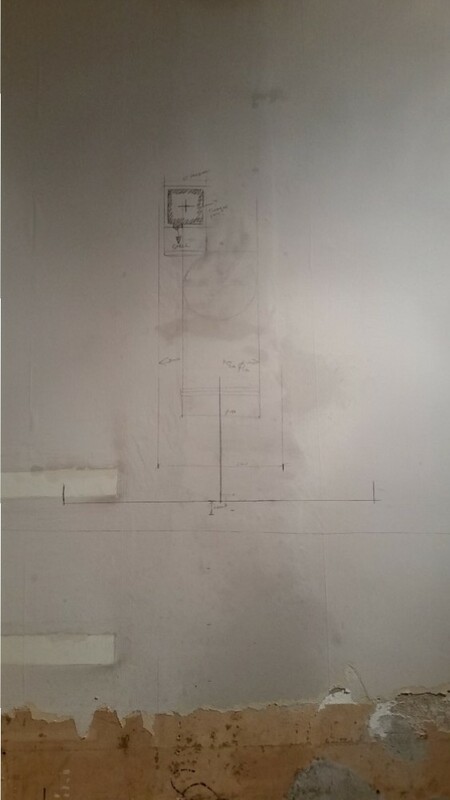 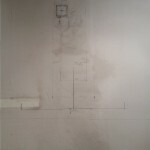 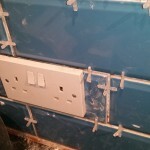 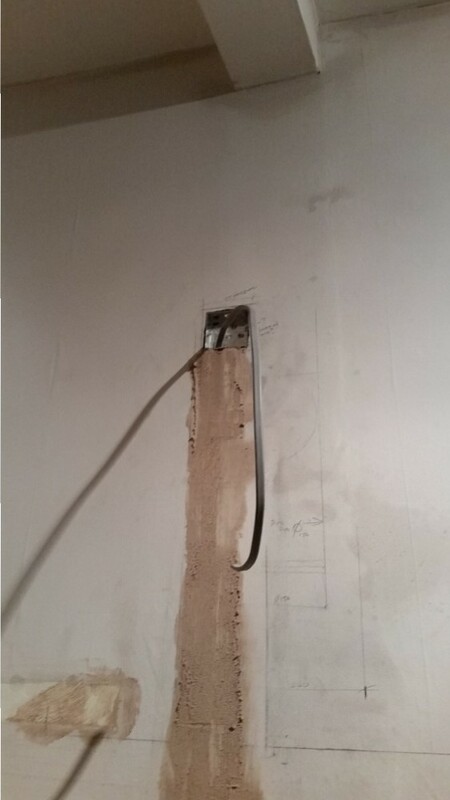 Once the cable had been installed the wall had to be made good using undercoat plaster and ready to begin tiling. 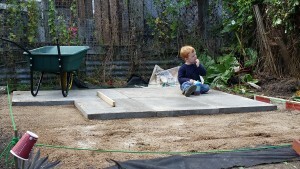 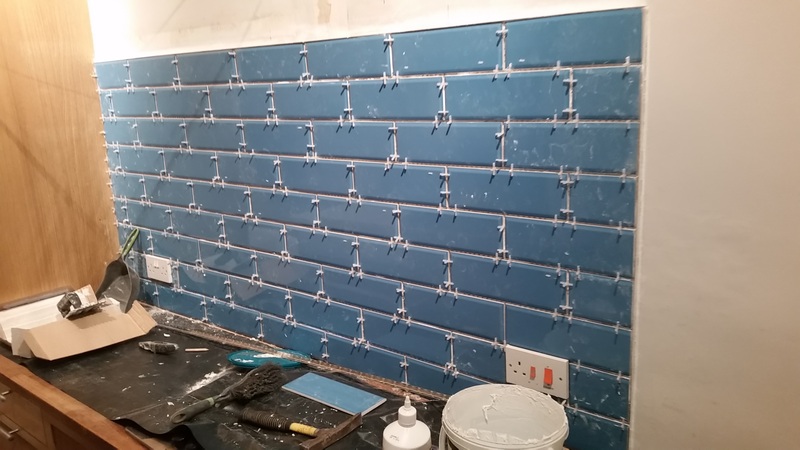 With the walls prepared tiling could begin. 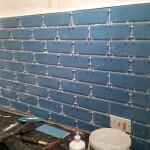 Fitting the tiles with a staggered brick effect can have a great finished result but can take a little more time to fit the tiles as all partial tiles at the end of a row have to be cut as you go to ensure all tiles above fit, unlike a standard tile pattern where you can cut all the partial tiles in one go after fitting all the whole tiles. 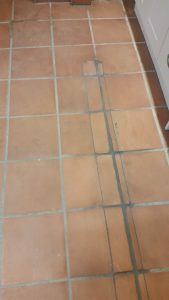 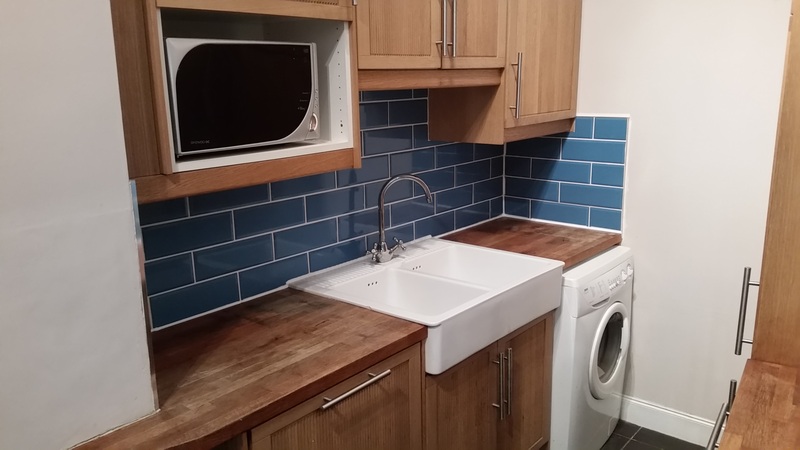 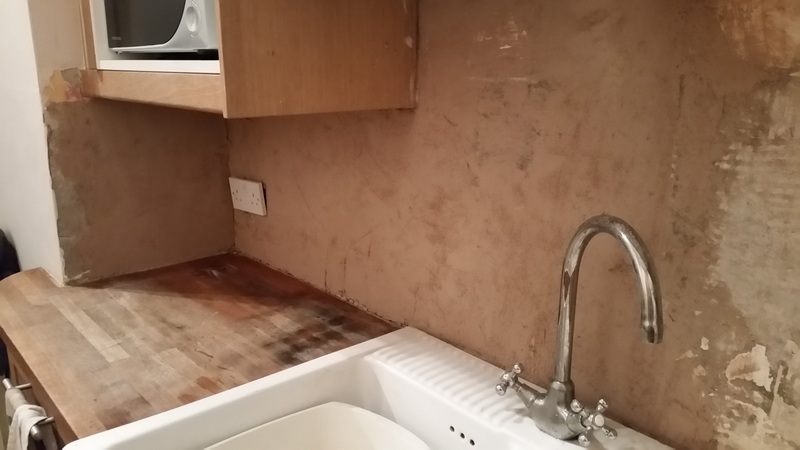 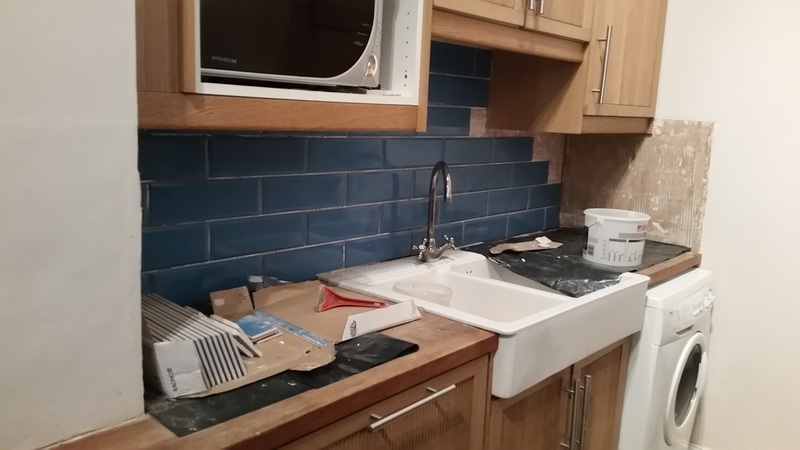 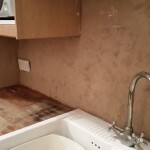 After all the tiles are in place, spacers removed and the tiles given a good clean to remove adhesive residue, the tiles were grouted using Micromax2 white grout. 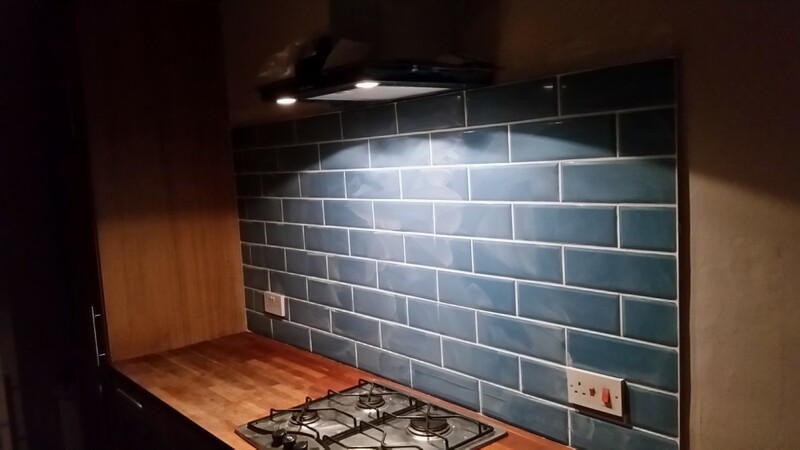 After grouting the cooker hood was fitted and some aluminium ducting installed to take all extractor air to existing vent where original extractor fan had been. 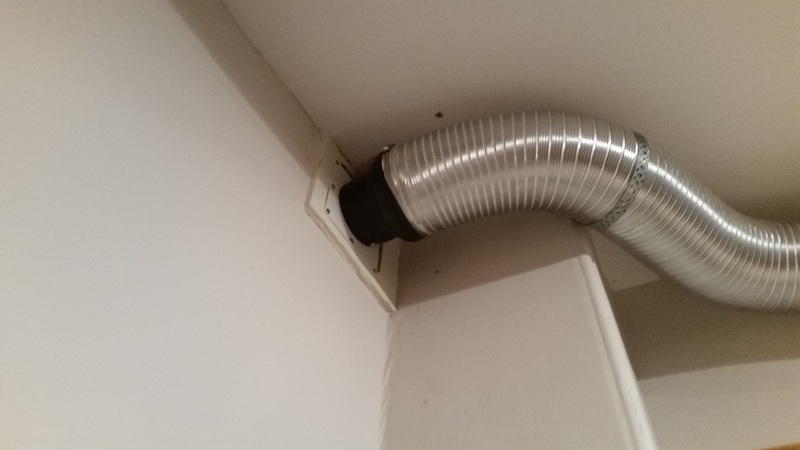 The IKEA VINDIG fan which was installed has a very good fan power and the ducting had to be secured into place well to avoid any vibrations. 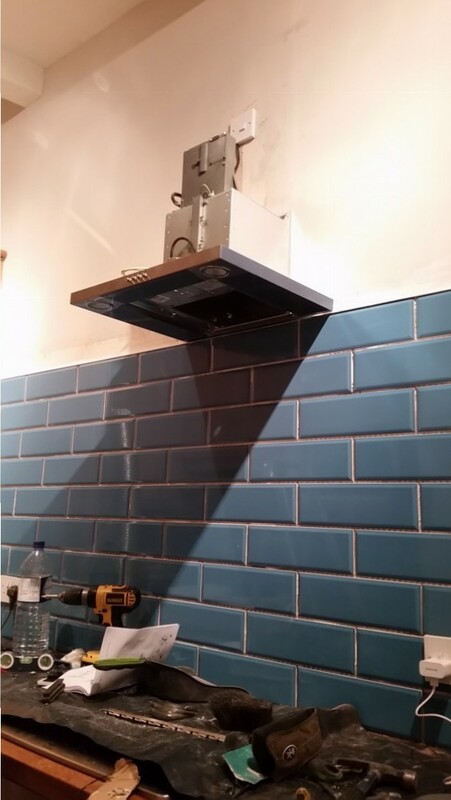 *Handy Hint. 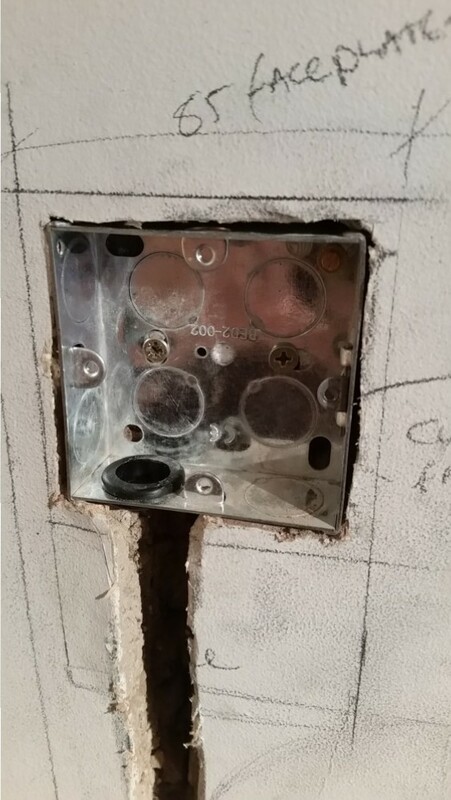 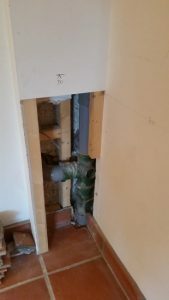 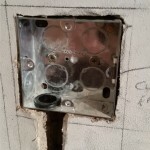 Getting the pipework to convert from 150mm down to 100mm diameter which was the existing hole size on the wall required a little bit of creativity. 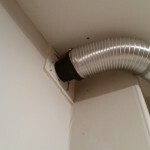 The reducer which comes with the IKEA VINDIG Hood does not quite go all the way to 100 mm but using the rubber seal from a Pan waste pipe connector over a 100mm jointing coupling it was possible to get a really good seal between the two. 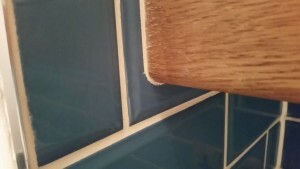 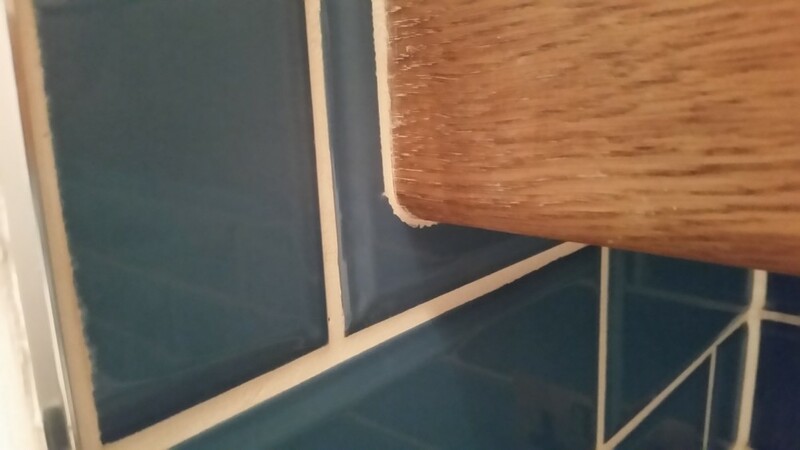 To finish off the tiles the join between tiles and worksurface was siliconed to give a clean wipeable seal. 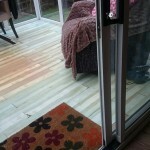 Job Done, with a happy customer. 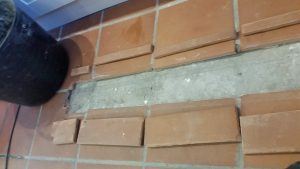 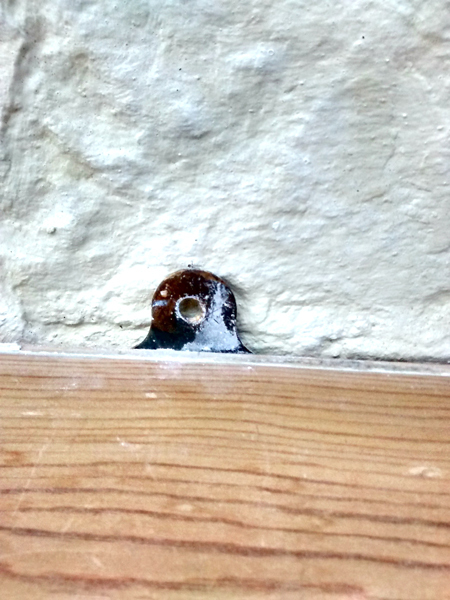 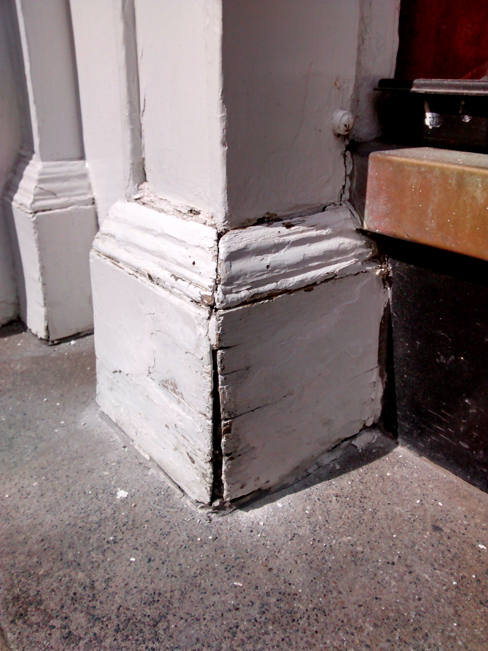 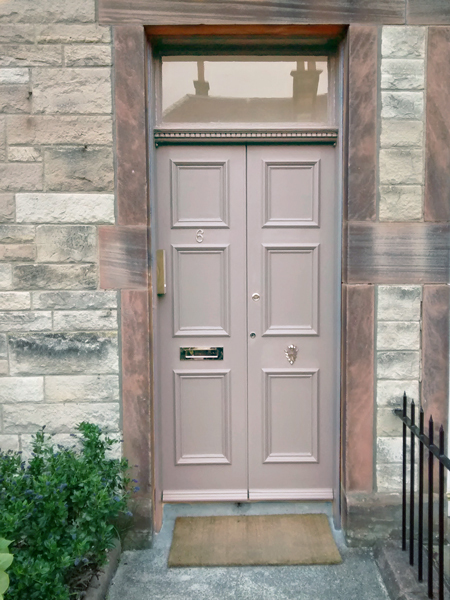 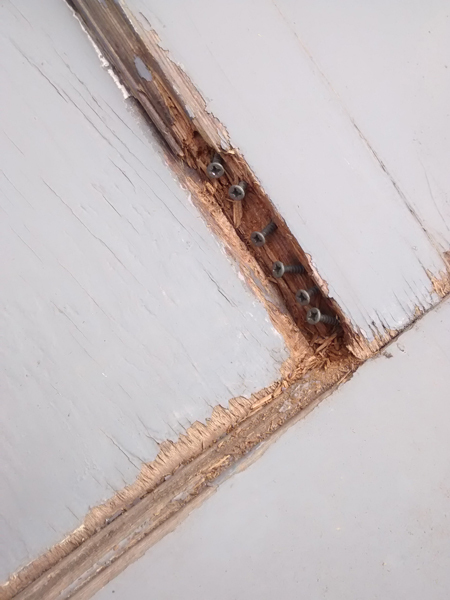 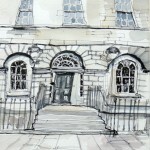 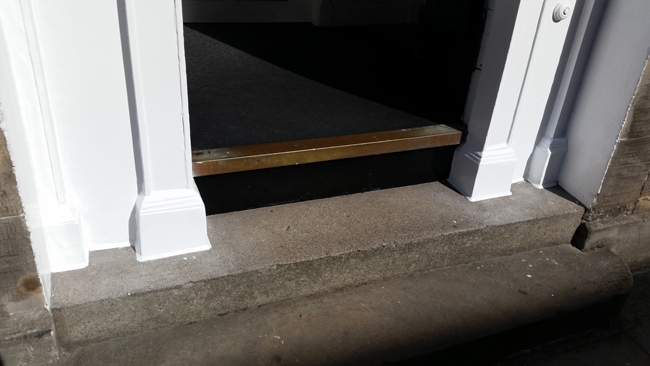 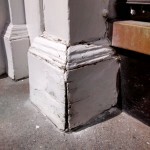 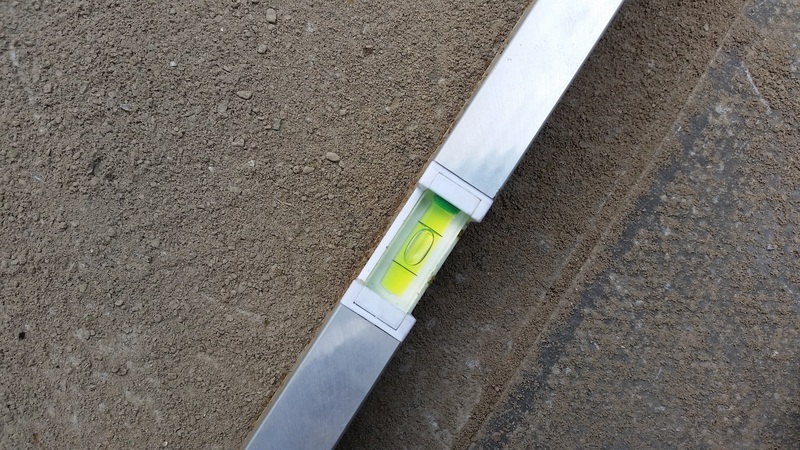 Handy David, Edinburgh Handyman Services, was asked to fix up the entrance to a local business, Nexus Business Space, as the mouldings at the foot of the main door surround had been badly repaired previously and were starting to deteriorate. 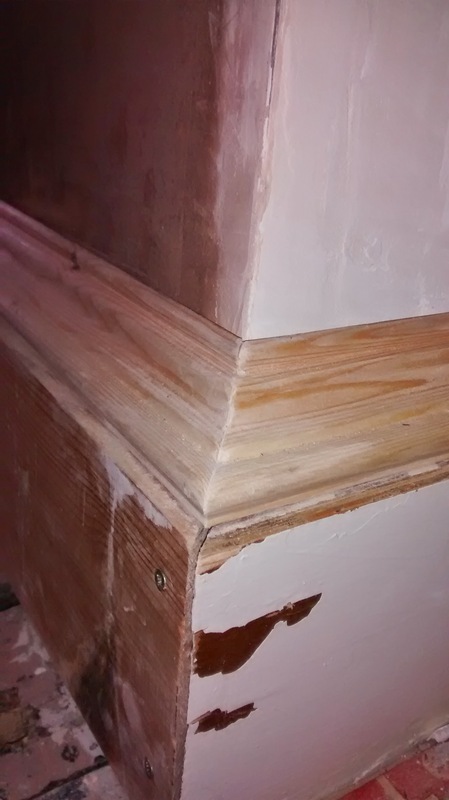 To fix the woodwork I first scraped all the soft filler that had been used and then removed the wooden mouldings to clean up and then re-affixed with panel pins. 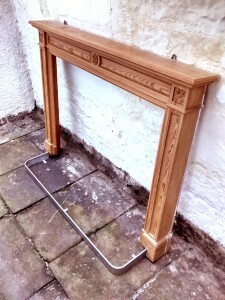 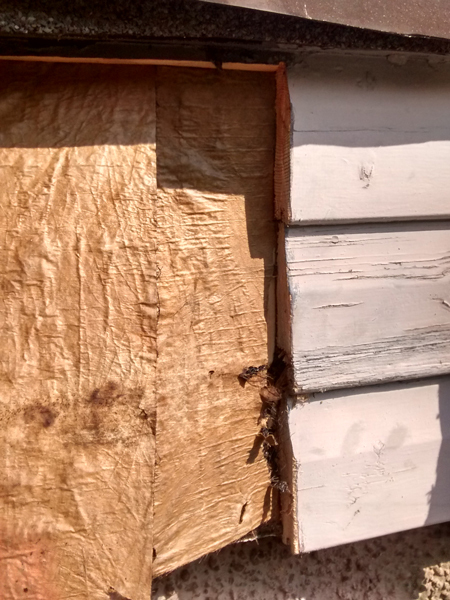 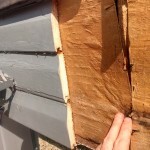 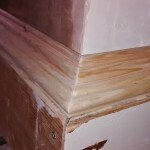 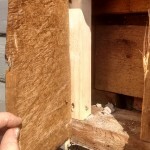 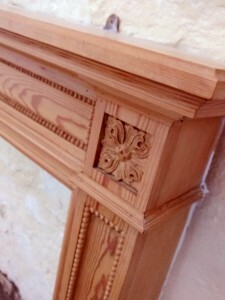 The woodwork was then filled, patched and sanded back with an exterior resin based filler. 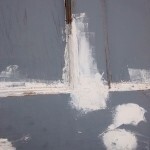 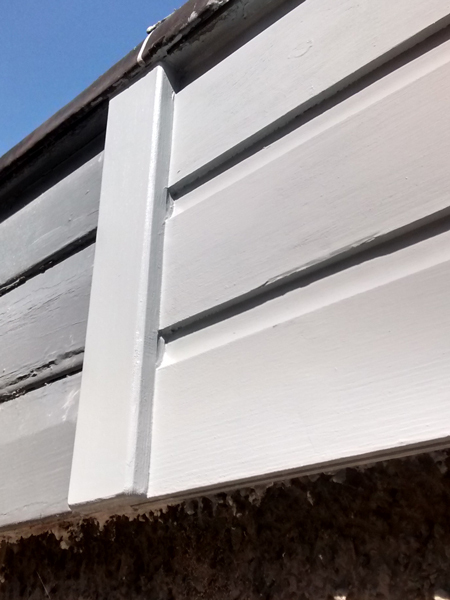 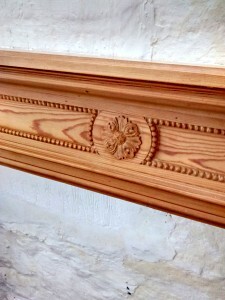 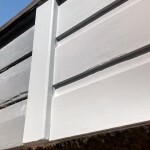 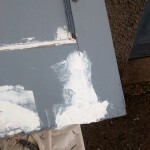 The repaired woodwork was painted with a coat of undercoat and 2 coats of gloss. 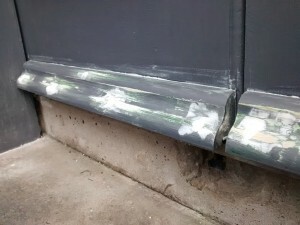 Exterior frame sealant was then applied to neaten up bottom edges. 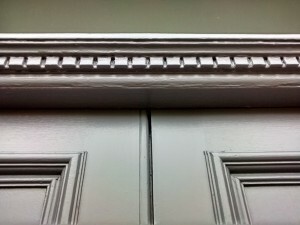 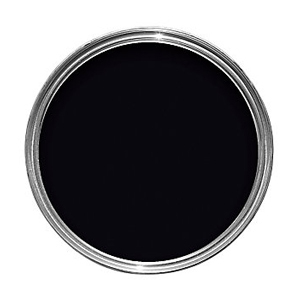 A coat of black gloss was applied to the kick-board as it looked a bit sorry for it’self once mouldings were finished. Painting a front door is an important job as it is a showpiece of anybody’s home, getting a good finish is very important. 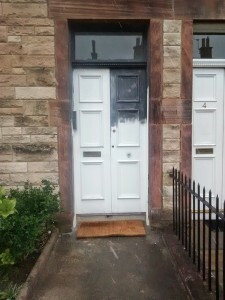 This door is a split door, which in itself only made the job minorly more difficult. 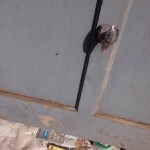 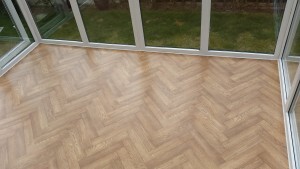 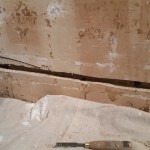 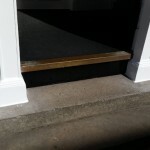 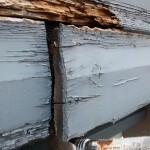 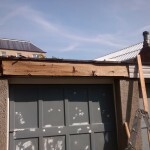 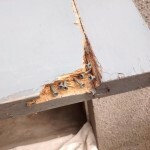 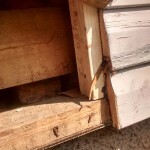 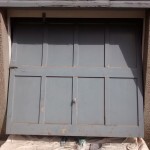 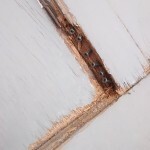 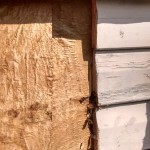 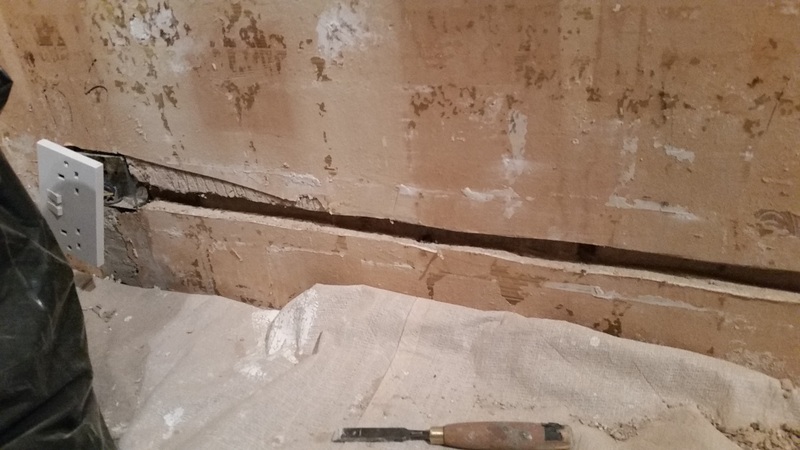 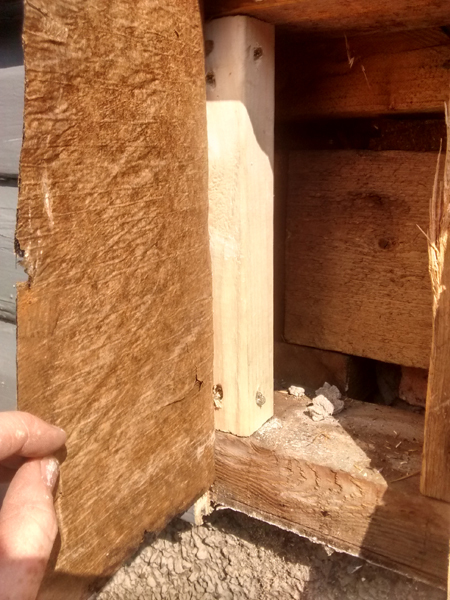 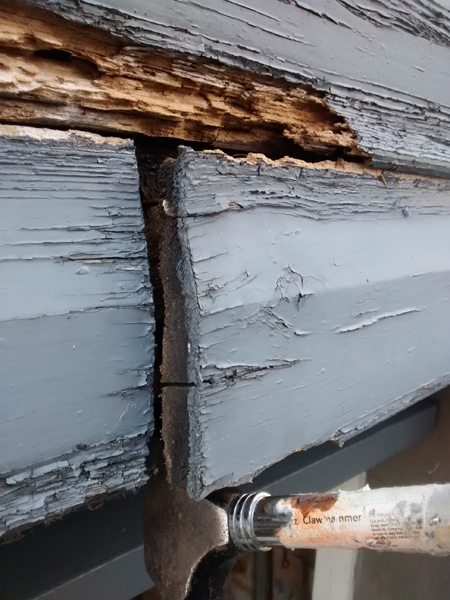 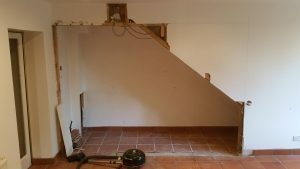 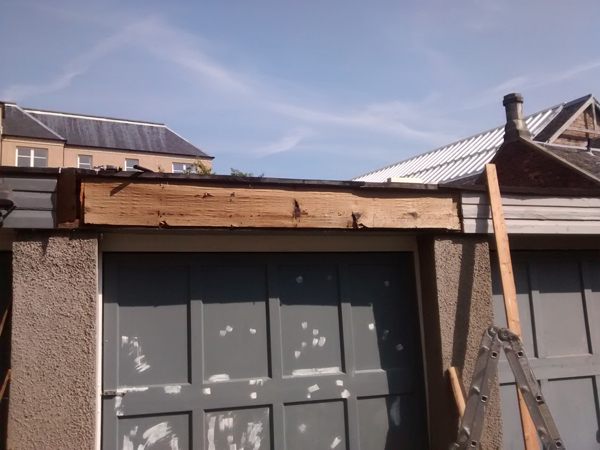 the first step was to sand down all the woodwork, and fill and repair any damaged sections, in particular the bottom or the door frame surround. 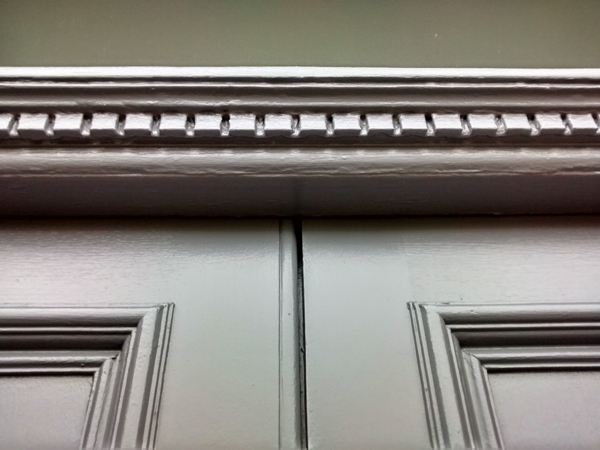 Preparation is the key job, sanding back the existing white paint to provide a key for the new dark grey finish that will be applied. 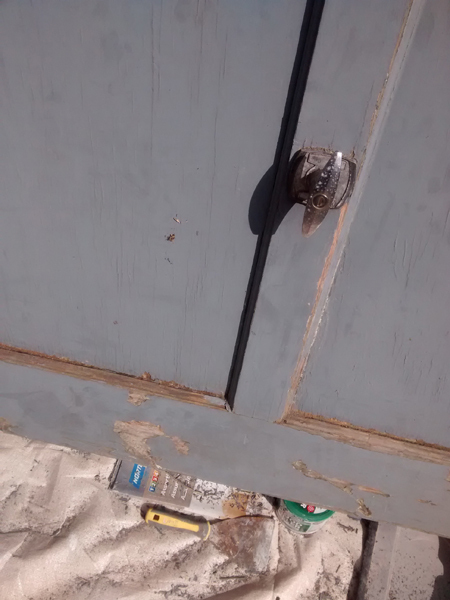 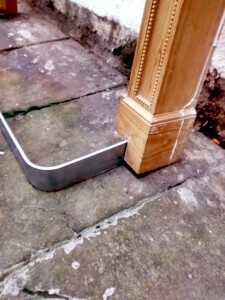 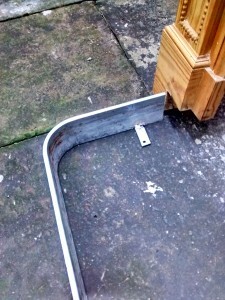 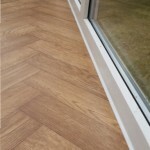 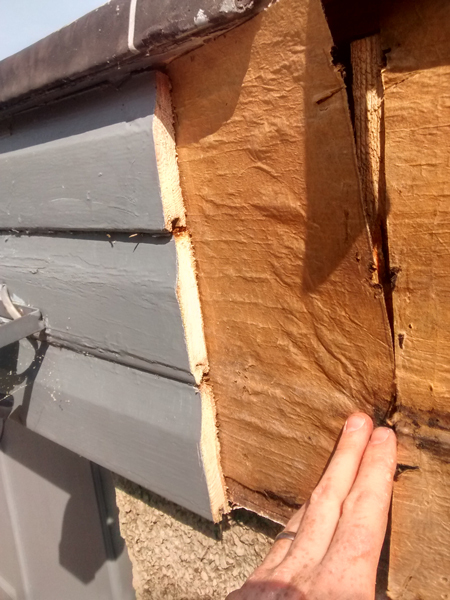 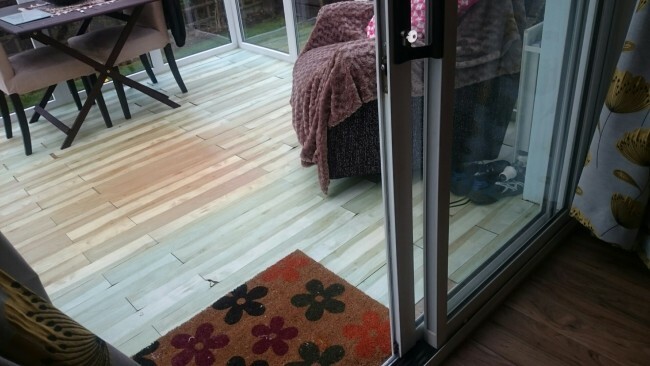 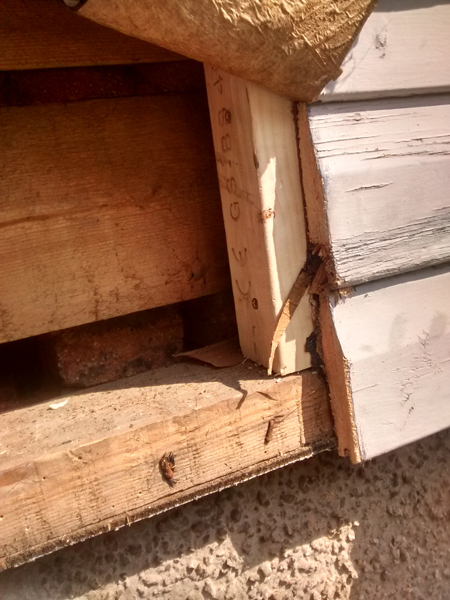 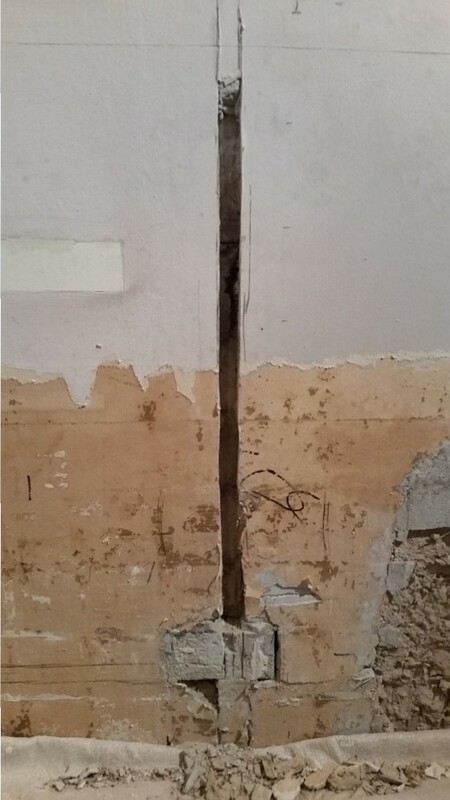 A wooden weather bar was fitted which has a rubber seal which will prevent the prevailing wind from blowing water under the door. 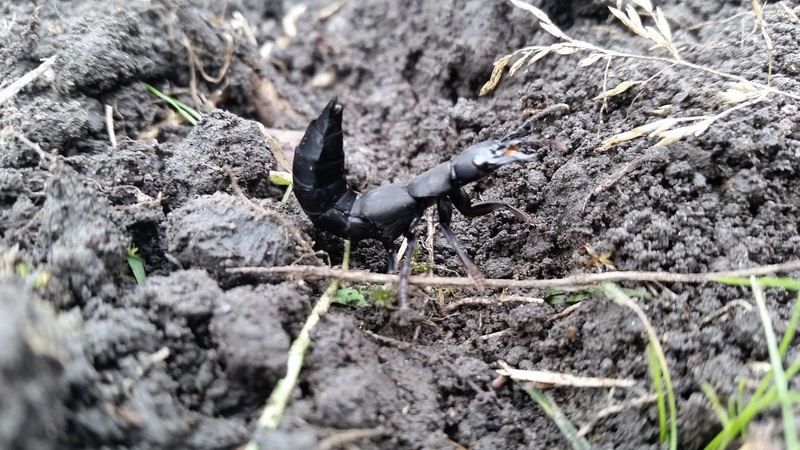 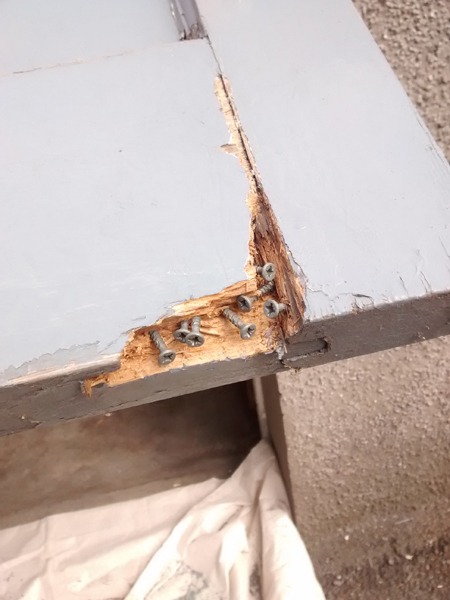 After being fully painted this was glued and screwed into position. 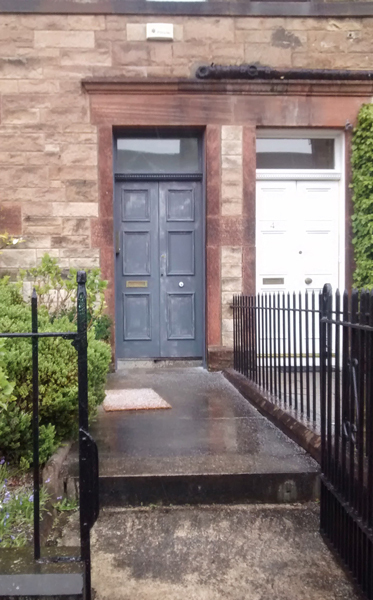 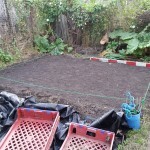 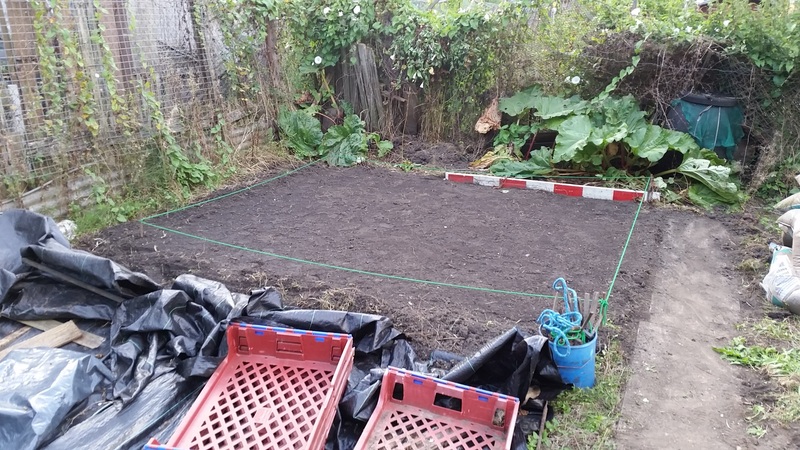 After making good the surface the dark grey undercoat was applied, which is no easy feat in early Scottish summer weather, several Hail storms stopped play! 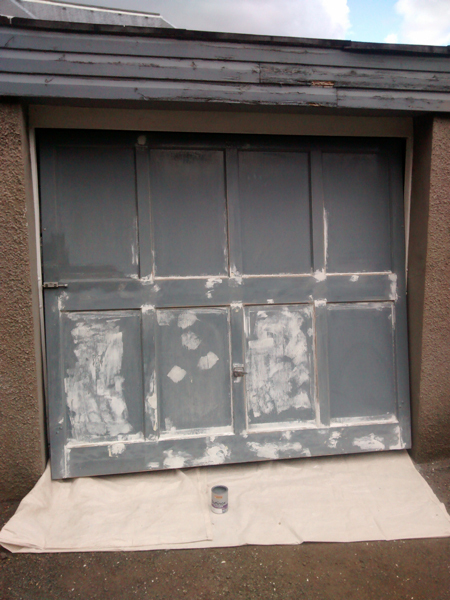 After 3 coats of undercoat, the top coats could be applied. 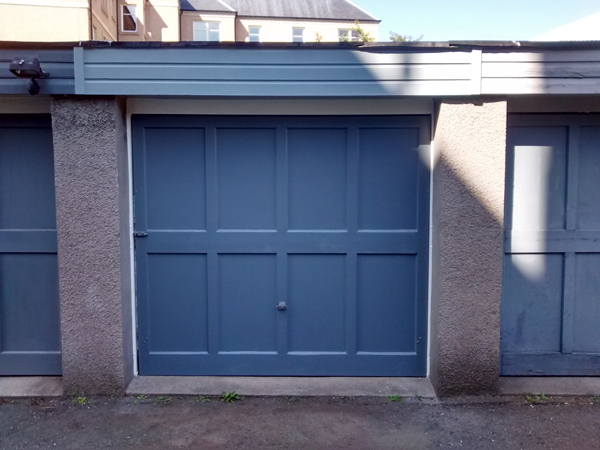 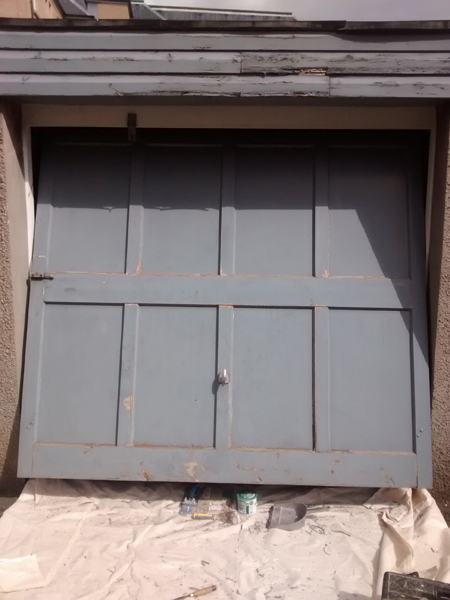 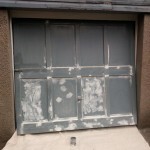 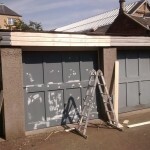 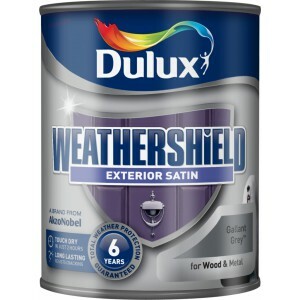 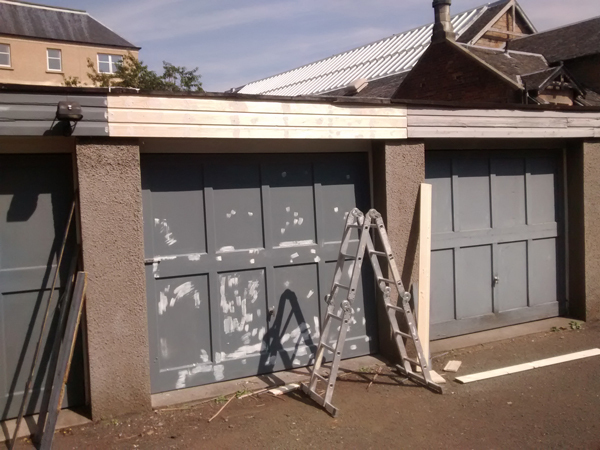 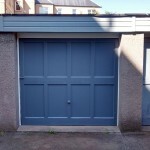 2 coats of Weathershield – Gallant grey, from Dulux was applied. 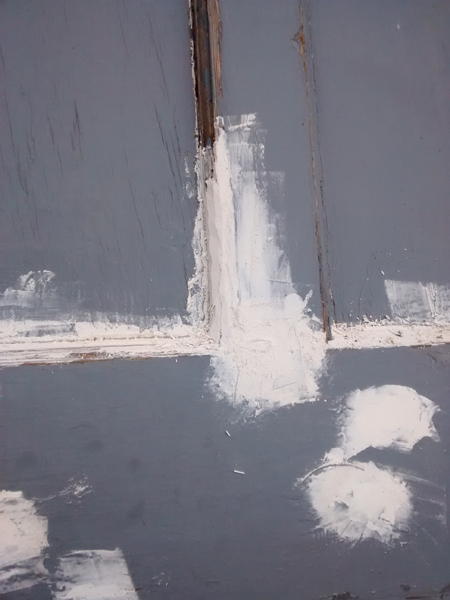 Quick dry paint does make things easier. 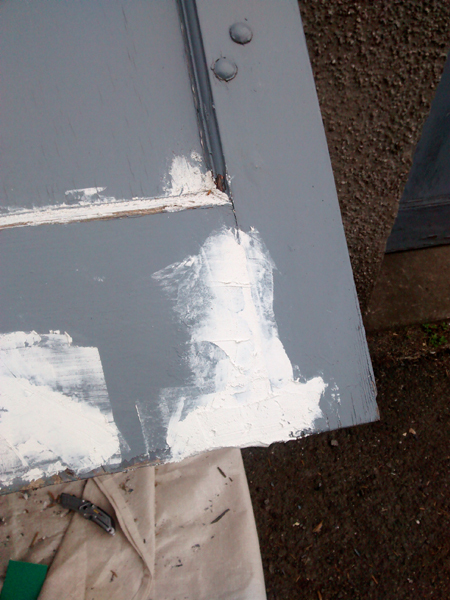 Once the paint was dry the previously removed door furniture could be replaced. 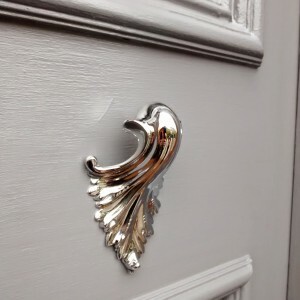 In this instance the original door furniture was brass but Chrome would be the desired finish. 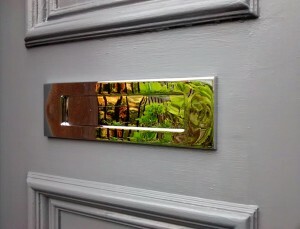 A new number, letter box and yale barrel were purchased and fitted, but for the rather unique brass door pull, we had to think outside the box, we could’t find a similar item in Chrome so we had the door pull and the escutcheon and the mortice rebate lock cover sent off to be chrome plated, and the returned items were better than could be hoped for. 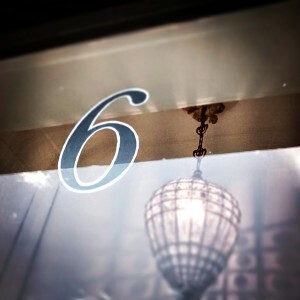 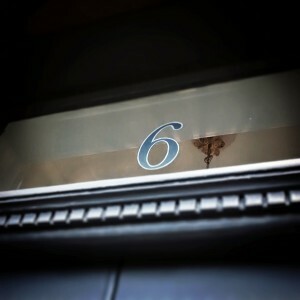 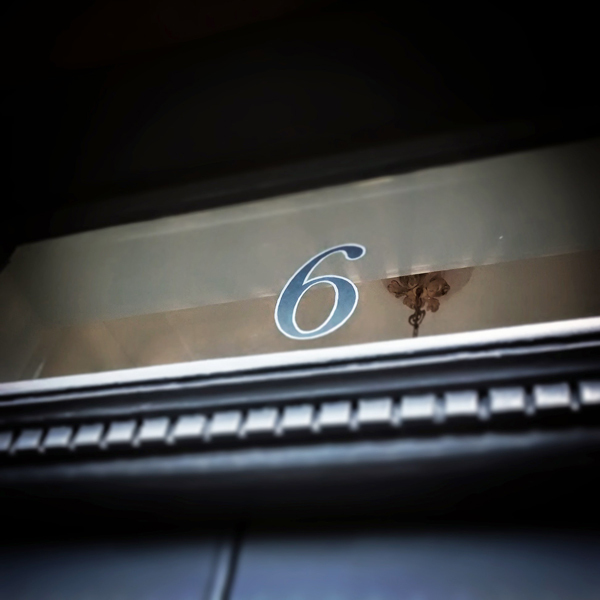 Lastly the house number was to be painted above the front door on the glass panel, the font and design were chosen then printed backwards and fitted to the outside of the window and the design was hand painted in layers on the inside. 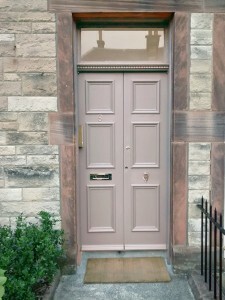 The number was painted in Gallant Grey to match the door and the outline way painted in Metallic Silver. 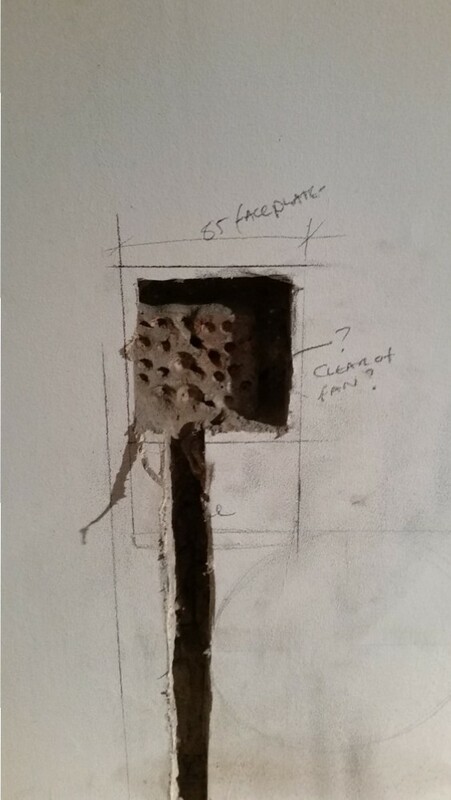 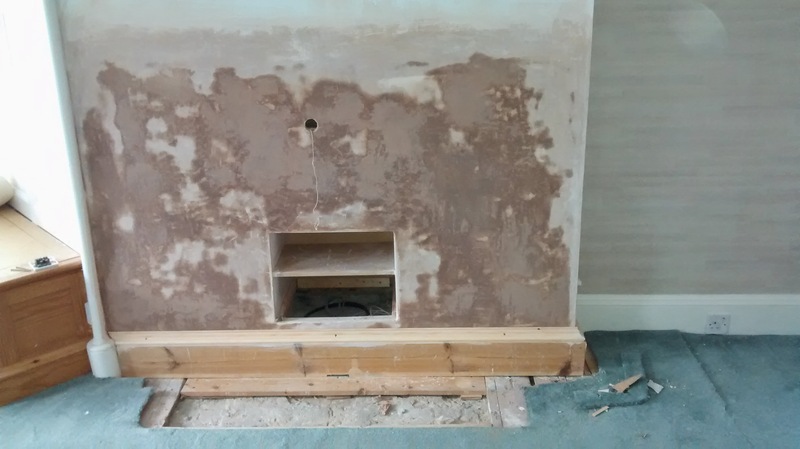 Handy David, Based in Edinburgh asked to remove an existing Fireplace and hearth to allow for installation of large wall mounted tv and recessed shelves for AV units. 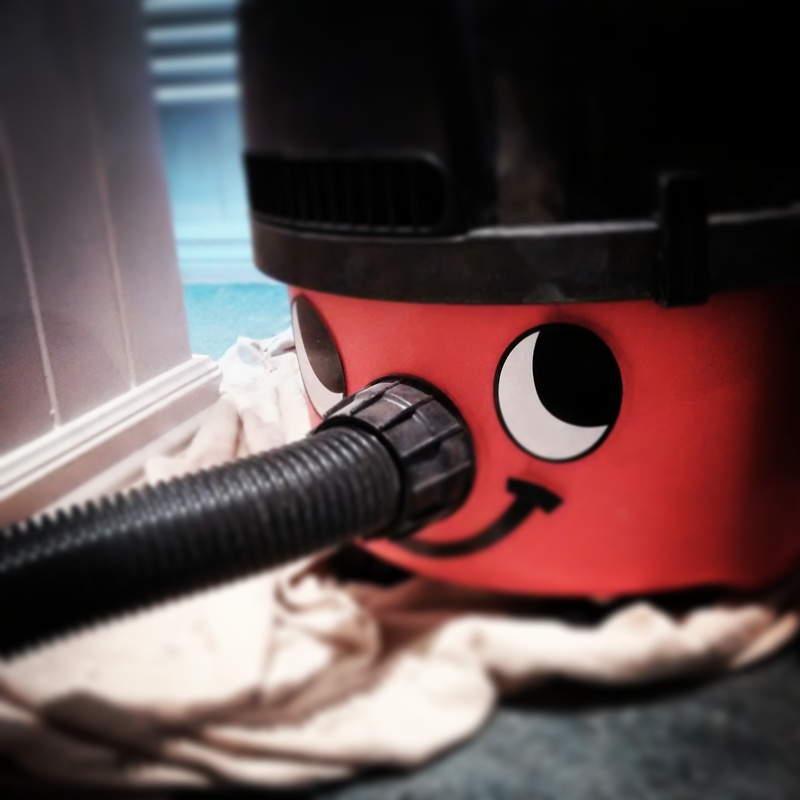 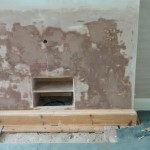 The fireplace took a fair bit of work to remove, intact, and there was a great deal of debris and sooty dust removed int he process, Henry Hoover was well worked on this occasion! 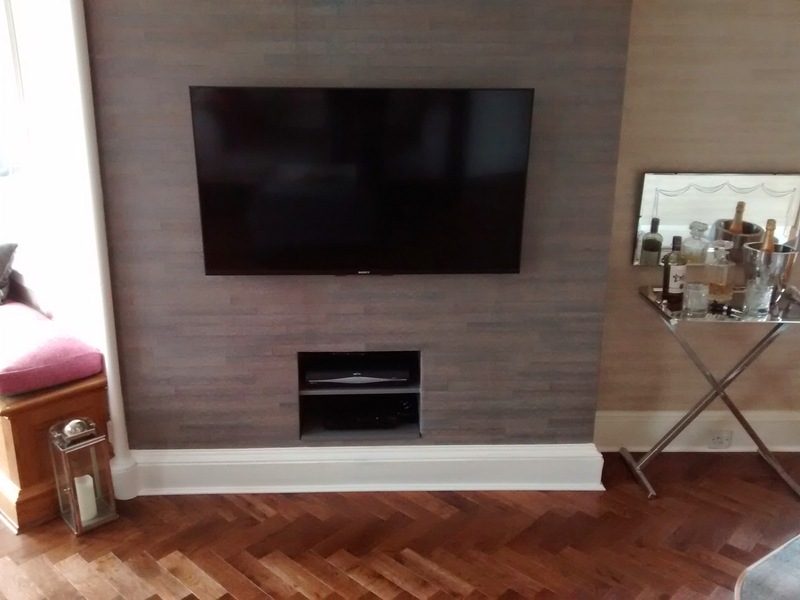 After removing the fireplace a boxing unit was built to shelf the AV equipment and then the fireplace was boarded up and the walls plastered and new traditional large format skirting board installed. 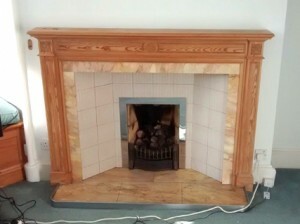 The flooring also required the hearth area to be brought up to the level of the surrounding floor. 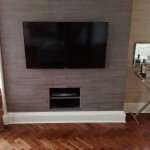 The wall was then Lined and Wallpapered on this occasion by the decorators and the TV installed by Anderson Installations. 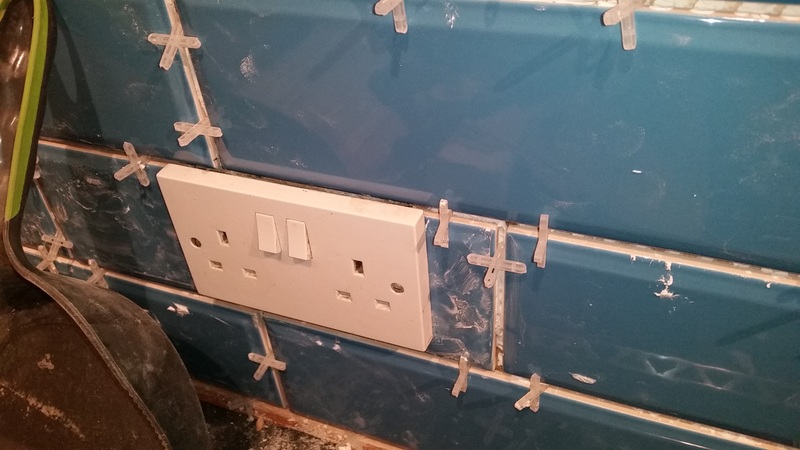 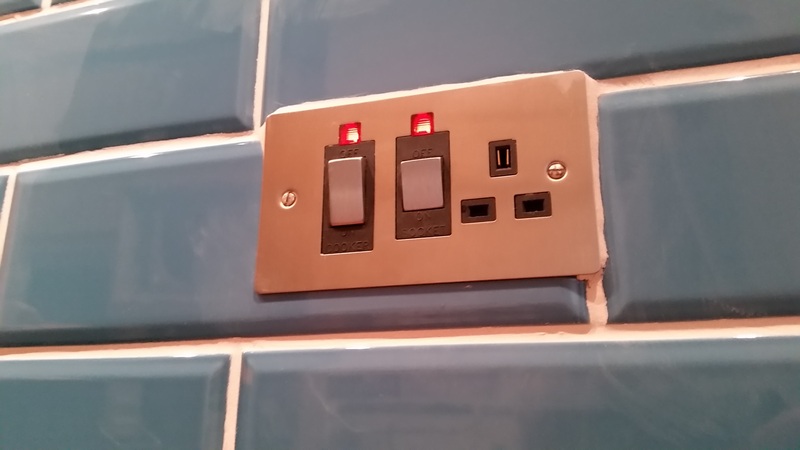 Close communications were observed to ensure cabling routes and wall finishes were to the required specifications of the other tradesmen.